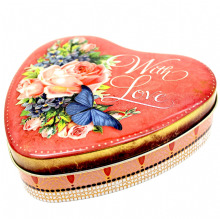 This romantic tin has intricately designed sides complimenting its cover of peach roses and purple butterfly. A nostalgic way to give something with love. This tin fits nicely into your pocket. Beautifully done, sturdily made with the convenience of an attached cover. 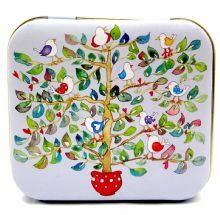 This is the designer tin to carry around and yes, show off. This tin fits nicely into your pocket. 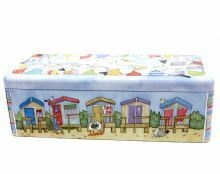 Beautifully done, sturdily made with the convenience of an attached cover, this is the designer tin to carry around and yes, show off. This little tin, with its impressive details, brings to life the sweet shop of long ago. Each side is different, showing parts of the shop. More impressive are the details of the stocks on display. Nostalgia? This is the tin to buy. 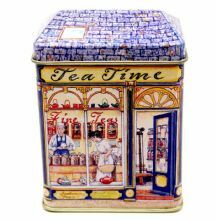 This little tin, with its impressive details, brings to life the tea shop of long ago. Each side is different, showing parts of the shop. More impressive are the details of the stocks on display. Nostalgia? This is the tin to buy. 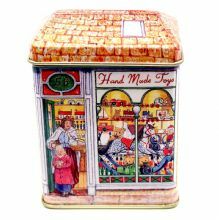 This little tin, with its impressive details, brings to life the toy shop of long ago. Each side is different, showing parts of the shop. More impressive are the details of the stocks on display. Nostalgia? This is the tin to buy. Practical and handy. This tin will go a long way to tidy things. Simple yet cleverly labelled. Finding those bits and pieces will be quick and easy. Figuring out where to put the tiny bits for a trip? This travel tin is the answer. It is handy and light. Moreover, its bright colours keep the holiday mood going. 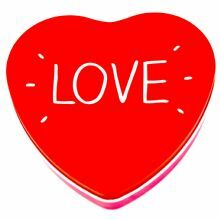 Mini heart tin, tiny yet strong, to hold little souvenirs or small precious items Beautifully designed and executed, the red and gold colours add elegance. What makes the world go round? This heart tin provides the answer. It is made to last. 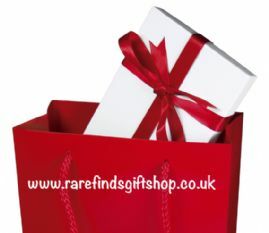 Something to give to those you cherish. A delightful way to express gratitude. 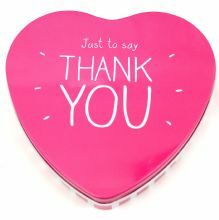 This heart tin in near fuchsia colour is well made. Years of enjoyment and the memory of the day somebody said "thank you"